Operation SAFE CHILD was created in July 2005 to raise awareness about child safety. Operation SAFE CHILD was created in July 2005 to raise awareness about child safety. Through an historic partnership with the New York State Police, New York City Police Department, New York State Sheriffs' Association and the New York State Association of Chiefs of Police, the Division of Criminal Justice Services and its Missing and Exploited Children Clearinghouse have expanded Operation SAFE CHILD. Statistics show that 34 percent of parents in the United States do not know their child's exact height, weight and eye color. And, when a child is reported missing, time can be the greatest adversary. Possessing up-to-date photographs and detailed information about a child can prove to be important proactive measures that can greatly assist local law enforcement officials to quickly respond to a child's disappearance. Using equipment that contains the latest digital fingerprinting technology and high resolution photography capabilities, the Erie County Sheriff's Office is able to produce a SAFE CHILD card for parents and guardians. The cards contain a child's name, biographical information (date of birth, gender, height, weight, hair color, eye color, etc. ), and a fingerprint image of both index fingers. The card can be made in less than two minutes and can be easily carried in a wallet or pocketbook. Interested parents can choose to store the fingerprints, basic biographical information and photographs of children who are not missing -- information critical to expediting the return of a missing child. The storage of information is entirely voluntary and requires the written consent of a parent or legal guardian. The information gathered is digitally recorded and stored in a database at the Division of Criminal Justice Services (DCJS) in Albany. In the event DCJS receives a missing child report, the fingerprints of that child will be included in a special search file and compared against all incoming fingerprints submitted to the agency. 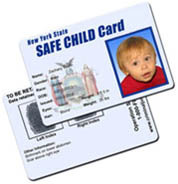 In addition to being able to quickly provide important details to police agencies investigating child disappearances, the New York State Sheriff Association SAFE CHILD Card will serve as an important tool when used in conjunction with the New York State AMBER Alert and Missing Child Alert programs. These cards will allow essential missing child information to be electronically disseminated, statewide if necessary, within minutes and dramatically increase the possibility of bringing a missing child home unharmed. For addition information contact: Deputy Aaron Naegely at 716-858-6305 or Aaron.Naegely@erie.gov for dates and times for Operation Safe Child Events.